Brian Bundridge focuses on heavy rail and the technical aspects of rail operations, and volunteers on the Mt. Rainier Scenic Railroad in his spare time as a conductor or engineer. Brian originally ran his own Washington State Transportation blog, which merged with STB. 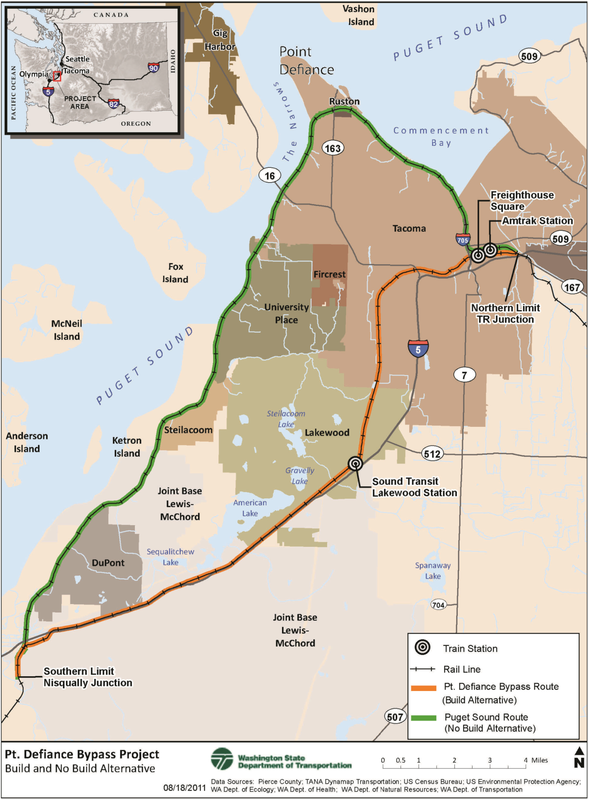 The Federal Railroad Administration (FRA) on Monday approved the Point Defiance Bypass, allowing WSDOT to finish the design, begin construction in 2015, and potentially complete it in 2017. 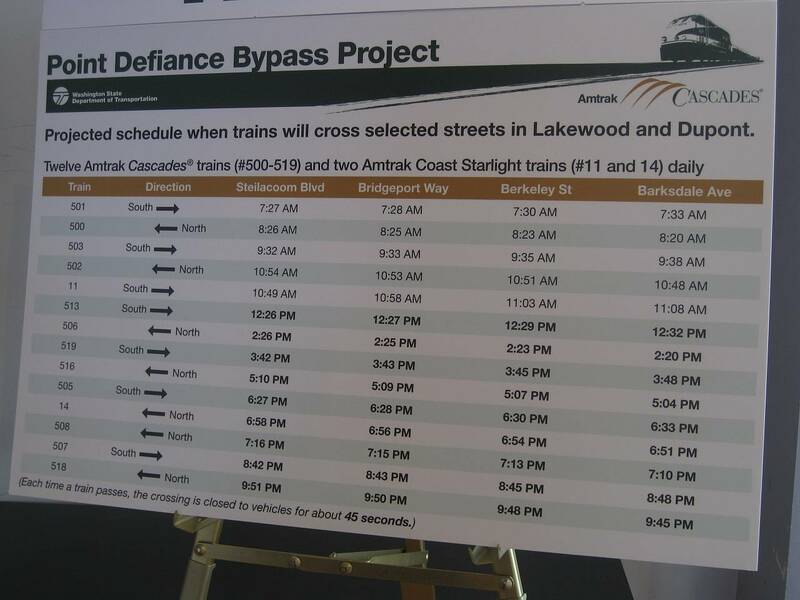 The bypass, starting at Tacoma’s Freighthouse Square and rejoining the BNSF mainline at Nisqually, will reduce the travel time between Seattle and Portland from 3 hours and 30 minutes for Amtrak Cascades trains to 3 hours and 15 minutes. The time savings on the route comes from the decrease in overall mileage, increased speed, and improved reliability. The bypass also removes 5 minutes of padding that was needed due to the frequent interactions with freight traffic in the Nelson Bennett area. All passenger trains, including the Amtrak Coast Starlight, will move to Freighthouse Square, closing the old station currently in use. This finding is open to appeal. Lakewood Mayor Don Anderson told The News Tribune on Monday that “the City Council will consider its options, including taking the project to court.” Mayor Anderson and the Lakewood City Council have a long history of opposing the project. 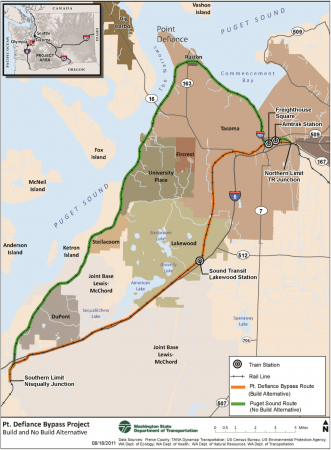 The bypass will allow the State to start 2 additional round trips between Seattle and Portland, assuming it resolves the uncertainty of funding for Amtrak Cascades. After 13 years, Sound Transit’s Sounder Commuter Rail service made its first run into South Tacoma and Lakewood. The train, greeted by media and dignitaries, completes the last piece of the original Sounder plan in Sound Move, an 81.8-mile corridor between Everett and Lakewood. Testing now ramps up. Starting this week, a 7-car Sounder trainset will be making runs between Freighthouse Square in Tacoma and Lakewood Station at initial speeds between 10mph to 20mph. The following week will ramp up speeds to 40mph and eventually the maximum speed of 60mph. The testing will include emergency drills, including stop/slide testing on the hill between M Street and D Street; adhesion testing between M Street and D Street to ensure the train can start safely with maximum loading of passengers; crossing malfunctions, which may include an occasional blow of the horn at times; and certification of the right of way for passenger use. These tests will happen between 8am and 4pm, every 30 to 60 minutes, Monday-Friday. However, please expect ANY TRAIN at ANY TIME and do not trespass! Freight trains that currently use the line will be permitted at 40mph between Lakewood Station and M Street. However, trains will still only have a maximum speed of 10mph south of Lakewood, due to the condition of the track. Reports that Tacoma Rail is running on the connector is not officially confirmed at this time, but during the testing phases I saw a Tacoma Rail train on the hill. The 8th and 9th peak-direction roundtrips to Tacoma start in 2013 and 2016 respectively. A third reverse-peak round trip also starts in 2016, and the next year ST will add an off-peak round trip. It is unclear which of these will terminate in Lakewood. This has been a long time coming and looking forward to riding the train. My excitement for this has been growing and hopefully ST will keep extending the train South. More information on the project is available here, here, and here. Amtrak Cascades and WSDOT debuted a revamped Bistro and Lounge car. The “Mt. Rainier” trainset is in the rotation currently featuring the new swag. Sound Transit’s Sounder D Street to M Street is moving along. D Street is open and C Street is now closed. Both of these crossings will be “wayside” horn crossings, meaning no loud train horns. Sound Transit’s M Street to Lakewood is mostly completed, with only punch-list items remaining. Testing is tentatively scheduled to begin in July. BNSF’s Delta yard in Everett to get 2 additional tracks as part of ARRA funding. Construction starts in shortly, providing additional relief for Amtrak Cascades trains. Canadian Pacific Railway is on strike, causing a delays to trains in North America. The ripple effect grows with each passing day. This does not affect commuter rail services or U.S. operations of Canadian Pacific Railway. The Mt. 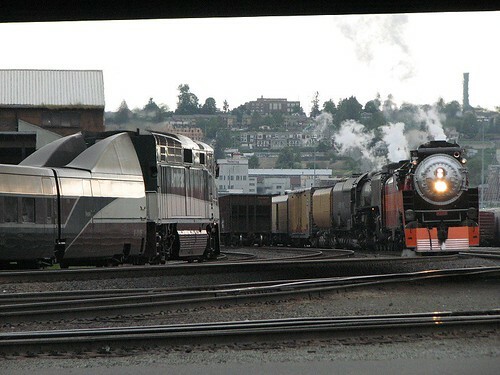 Rainier Scenic Railroad will be at the LeMay Auto Museum grand opening, June 2-3, providing train rides behind a 1922 Baldwin steam locomotive and a classic diesel locomotive. No advanced reservations are required. Fare is $10. Oregon’s new trainsets are due to arrive in July. Certification and testing will start shortly after arrival in non-revenue service with start of service later in the Fall. Could new coal trains prevent new Amtrak Cascade service? Oregon Governor John Kitzhaber believes so. Seattle City Council also opposes coal-export ports and the coal trains that would come with it. Could Coal Train traffic really be bad news for Public Health? Rail advocates continue to push for Blaine Amtrak Cascades stop. White Rock and Surrey councils are behind the project as well. Washington and Oregon recently announced a new partnership that will develop a plan for managing passenger rail services between Eugene, Oregon and Vancouver, B.C., as a single corridor, rather than two separate corridors as today. 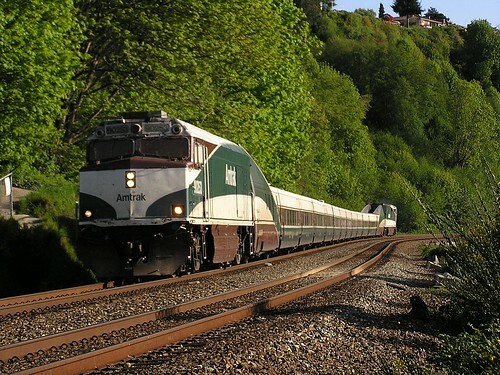 Transportation officials in Washington and Oregon signed an agreement that begins the ground work for faster, reliable, and more frequent Amtrak Cascades service. What does this mean for passengers? Right now, little will change on the ground, but cost management, productivity, capital planning, and scheduling will be under a single office. John Sibold is the new Cascade Corridor director. Sibold has been the Rail and Marine director at the Washington State Department of Transportation since August and will focus on improving the reliability of passenger-rail service and managing the state’s freight lines. Plenty more information after the jump! The Washington State Department of Transportation has some good news for the rail corridors plagued with mudslides, but the project won’t be finished until late 2015. Early Wednesday morning, a mudslide between Mukilteo and Everett, caused cancellation of Sounder and Amtrak Cascades service for 48 hours*. WSDOT’s $16.1m Corridor Reliability Slide Management Project will review problematic locations and reduce mudslides along the route. 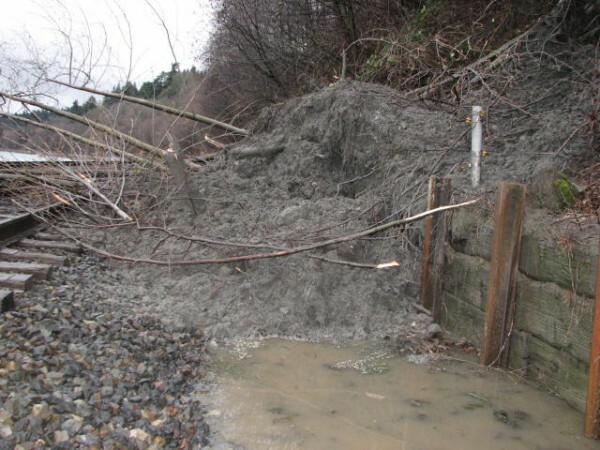 In 2011, over 100 Sounder and Amtrak trains were cancelled due to mudslides. While this project will not eliminate all mudslide dangers, it is a step in the right direction to minimize service disruptions. Anytime a mudslide occurs, BNSF Railway (owner of the tracks in our region) imposes a 48-hour restriction on passenger trains. WSDOT and BNSF are working together to reduce and/or eliminate this rule, depending on the severity of the slide. This is positive and much needed relief on what plagues on-time performance and reliability of our trains. 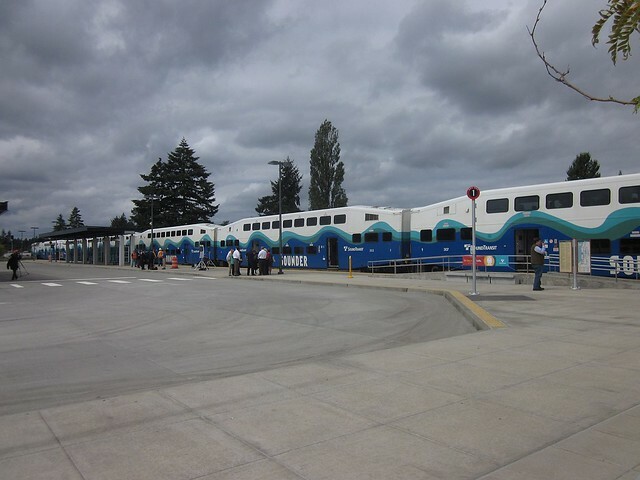 *Empire Builder service will be truncated in Everett and passengers bused to Edmonds and Seattle. Eastbound passengers will be bused to Everett and board the train there. It’s been a long time since I have done one of these updates but there has been plenty of work going on in our region. With the increase of rail traffic between Seattle and Portland, passenger train reliability has taken a noticeable hit. So what’s going been going on? 1. Recovery from the snow and ice storm added several slow orders. The on-time performance of most trains have mostly recovered and repairs along the BNSF Seattle Subdivision, Scenic Subdivision and Bellingham Subdivision are completed. Snow, ice, mudslides, downed trees, a small sink hole, and heavy wash from the Puget Sound all took its toll on the right of way. With these problems now fixed, track maintenance has ramped up. Those that ride Sounder and Amtrak should notice several pieces of Maintenance of Way equipment working between Tukwila and Tacoma for a tie replacement project and a rather rocky, rough ride on the corridor as the work progresses. The Washington State Department of Transportation, Rail and Marine division, held a meeting at Clover Park Technical College regarding the Point Defiance Bypass on Monday, May 17th. The meeting highlighted several key and important factors regarding the project, including the highly debated issue of the 10 grade crossings along the route. The Federal Railroad Administration (FRA), not the State of Washington, is requiring a project-level Environmental Assessment (EA) before Phase 2 of the funding can be made available for construction. The EA should be completed by the end of 2010 with the FRA issuing a finding in 2011. Construction of Phase 2 will start in 2012 with an estimated completion time of 2014. This will push back the 5th and 6th round trip of the Cascades to 2014/2015 as well. 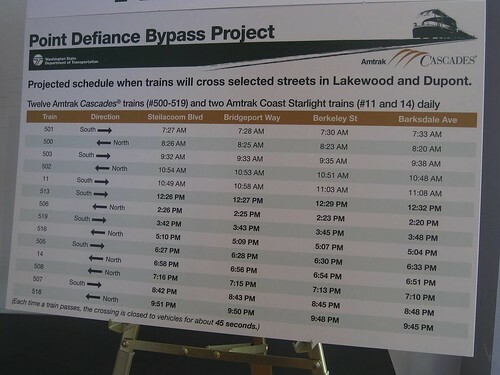 This does not affect the estimated start of Sounder service to Lakewood in 2013. More after the jump. Great news for travelers to Vancouver B.C.! The second train to Canada will continue operating until September 30, 2010. During the 2010 Olympics and Paralympic Winter Games, more than 11,000 passengers rode the new service. The future of the train service depends on whether the ridership was primarily for the Olympics or if there exists sustained demand for a second train. Canada’s Border Services Agency will waive a $1,500-per-day border inspection fee, money that Washington state doesn’t have budgeted, if it finds the daily ridership sufficient to justify the extra customs agents at Pacific Central Station. Bremerton ferry was once again down to one boat due to the M/V Kitsap having a cracked hull, discovered during a maintenance inspection. The route is back on a two-boat schedule with the 90-car M/V Sealth on the Bremerton run and the 34-car M/V Hiyu on the Pt. Defiance – Tahlequah route. 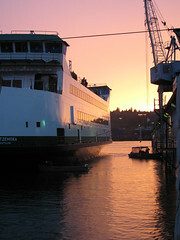 Return of the Port Townsend passenger-only ferry? Not if Commissioner Phil Johnson has his way. Progress on the M/V Chetzemoka – Placed in water for the first time last week! Wiring work continues. Keller ferry update – Replacement coming soon? A new version of vessel watch now available. No more free rides for ferry workers. State is still trying to reduce the costs of WSF. Wasteful spending on ferry system has outraged leaders and the public. One lucky deckhand made nearly $73,000 in travel reimbursements…. The Oregon Department of Transportation moved forward with purchasing two 8th-generation Talgo trains on February 26th, joining Wisconsin’s train order and saving roughly $6m in the deal. The trains are marketed for North American operations and meet FRA requirements. The trains will consist of 13 cars (instead of WSDOT’s planned 14-car trains), seating 285 passengers (instead of 300) and will have free wifi, a bistro/lounge car, coach and business classes, along with baggage and continued bicycle services. These will be built at the new Milwaukee, Wisconsin Talgo assembly plant. These will most likely not use the Talgo-Siemens BT diesel/hydraulic locomotive; however, the Wisconsin trains may use the cab car from the BT locomotive. The stimulus funded rebuilt GE P40 locomotives will be used to power these trains. The way these trains will be integrated into Cascades is still to be determined. The WSDOT mid- and long-range plans did not consider that ODOT might purchase their own train-sets, even though the mid-range plan was drawn up during the time Oregon was looking at purchasing bi-level coaches and used locomotives, similar to what is seen on the Amtrak California and Surfliner corridors. ODOT will continue to run 2 daily trains and is in negotiations with the Union Pacific Railroad to increase service to 4 daily trains; increase speeds to 79mph for the majority of the route (which mostly just involves improving grade crossing circuit timings); improve reliability between Eugene and Portland, including extending sidings and add double track in key bottlenecks; and reduce run times. Oregon continues to study the Portland and Western Railroad for a 150mph double track electrified corridor. ODOT staff did not given any clues as to how they will deploy these trainsets when they enter revenue service in 2012, except that they will be used only in the Eugene-to-Portland segment. Given that constraint, one sensible choice would be to replace the two bus round trips that currently connect with Cascades trains that terminate at Portland. M/V Sealth still out of service after damage to the vessel’s engine output shaft. WSDOT is offering ride vouchers for those disrupted during the Port Townsend/Keystone closure. M/V Chetzemoka is progressing swiftly. Todd Shipyards are installing windows, doors, lighting and other accessories on-board the vessel currently. The Chetzomoka is scheduled to start service this Summer once six weeks of crew training and sea trials are completed. Speaking of new ferries, the first 144-car ferry is scheduled to start construction next year. The state wants ferry rider opinions on the services. 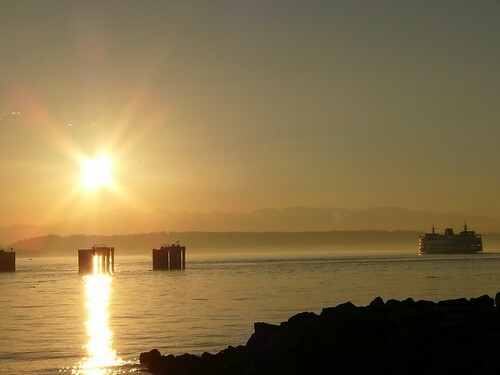 Did you know that there are several other ferry systems around Washington State? Exploring some of these operations could make for a fantastic vacation this summer! Did you know that all ferries shares something similar to diesel locomotives? 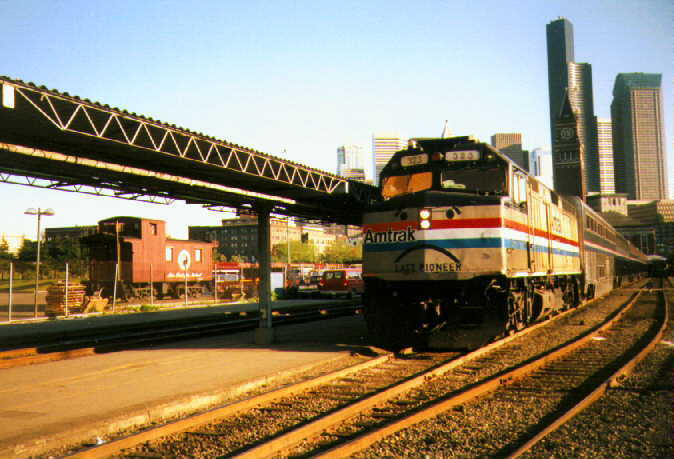 The Super Jumbo Mark II vessels for example use the same high powered engines that EMD uses in their SD70 series locomotives. The Super Jumbo Mark II however has 4 engines, producing 4000HP each. Amtrak is planning, yet again, to purchase new locomotives and passenger cars to replace the aging fleet. The NEC still will not be a true HSR route, even with the planned “Acela II” with a maximum speed of 180mph, now the low end standard of HSR. Due for replacement are 412 Amfleet I, 122 Amfleet II, 122 Superliner I, 184 Superliner II, 50 Viewliner, 92 Horizon cars, as well as Heritage baggage and dining cars. Among the locomotives are 20 AEM7 d.c. electric locomotives (the remaining 29 have been rebuilt with a.c. propulsion), and the railroad’s F59PH, P42, P40, and P32DM fleets. Currently, an RFP is out for 125 single-level coaches/baggage-dorm cars/diners and 20 electric locomotives. Plenty more after the jump! Just got wind of a BNSF derailment in Gold Bar, Washington. It is unknown how bad the accident may be at this time. It is known to be a intermodal/container train bound for Tacoma, Washington. This occurred on the Stevens Pass route, about 32 miles Northeast of Seattle. This will most likely affect Amtrak’s Empire Builder trains 7 and 8 depending on the location and severity of the derailment. It is unknown if Amtrak will bus passengers or detour the train if it is blocking the main line. More details to come as I get them. UPDATE 4:50pm: Train was the S-LPCTAC with one, maybe two cars on the ground. SE King County Commuter Rail coming soon? Imagine getting off Sounder or a bus at Auburn station and a few short minutes later, another sleek, quiet train pulls into the station. This could happen in a few short years for Maple Valley, Covington, and Black Diamond residences. Those of you traveling via Amtrak this Thanksgiving weekend, be glad you purchased your tickets early! If you want to take the train to see your friends and family, Wednesday will be your best bet, however, Seattle – Portland trains are starting to sell out very fast. Those traveling between Seattle and Portland, the 5 Cascades trains and extra Ambus are all sold out on Thanksgiving day with the Coast Starlight still available for coach passengers only. There are 2 trains available currently for Portland to Seattle passengers. Amtrak Extra #514 and the Coast Starlight. Train #514 will most likely be the last resort train since it arrives into Seattle at 11:15pm. Trains are available in all directions on Friday and Saturday. On Sunday, there will be 6 scheduled Cascades trains and the Coast Starlight. Most of these trains are starting to sell out now. Make your reservations soon in order to ensure you have a spot. Sleeper service on the Coast Starlight and both sections of the Empire Builder are selling out rapidly. For passengers going to Vancouver, BC from Seattle, WA, all trains and Ambus’ service is available throughout the entire weekend. For passengers going to Seattle, WA from Vancouver, BC, all trains and Ambus service is available throughout the entire weekend. Business class is sold out on Train #513 at this time however. For passengers going East to Spokane, WA, both Empire Builder’s (Seattle and Portland Sections) are available throughout the entire weekend. 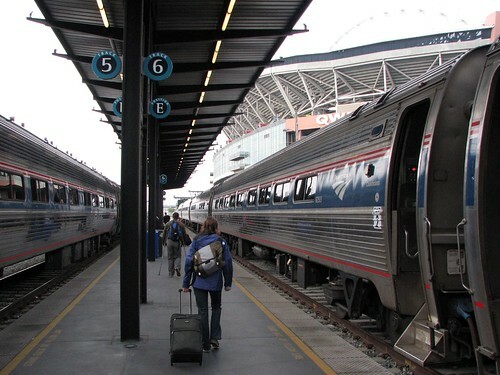 For passengers going West to Seattle, WA, both Empire Builder’s (Seattle and Portland sections) are available. Lower level coach seating is sold out on Train # 7 and #27 at this time however. For those that haven’t made reservations, go to http://www.amtrak.com and follow the easy steps. It takes no more than 5 to 10 minutes and you can pick your ticket up at the station or have it mailed to you. It would probably be best if you pick it up at the QuikTrak kiosk at the station. Extra train equipment will be a mixture of Horizon and Amfleet coaches with a snack car available. The cars will be later used for the Alki Tours Leavenworth Snow Trains. [UPDATE from Brian:] I went up to check out how the clean up was progressing. The LRV is now back on the rails and clear of the SB track Damage to the pantograph and skirting is pretty bad and will most likely need to be replaced. The brandt rail truck is still blocking the SB track with several men and equipment working on the rails and/or checking out the damage to the guideway. Two BNSF trucks were also around with a heavy boom/crane truck. The wind and rain is really starting to pick up. While it has taken them a long time to get this mess cleaned up and ask a lot of questions, I have to hand it to the crew that is cleaning up the incident. I for one would not want to be in it! [UPDATE: KING 5 reports that there may be disruptions on the Tuesday morning commute. Buses may run between Stadium and Mt. Baker whenever they decide to move the train, temporarily blocking both tracks. Expect minor delays of 10 to 20 minutes to light rail service. Trains are crossing over at the O&M and using the northbound tunnel for Beacon Hill and Mt. Baker Stations. The trains will cross back over at South Walden Street. King 5 has aerial pictures of the incident here. Martin just tweeted that Seatac Airport Link Station will open on December 19th at 10am. This station will be the new south terminus of our light rail line. More details to come. Ben: As a regular 194 user, I want to point out that the “32 minute” versus “36 minute” nonsense is just that – nonsense. On top of all the user quality points like offboard payment and plenty of space, both improving boarding times and reducing delay, your average wait for a Link train will be half that of the 194 – off-peak, you’ll probably save ten or fifteen minutes in door to door time. Stanwood Station opens November 21. Full press release after the jump. New Studies: Amtrak has completed the studies to possibly return two long distance trains back in service. The North Coast Hiawatha (Trains 9 and 10), which would run from Seattle to Chicago via Stampede Pass, lower Montana, and North Dakota. The cost of the train would be steep at nearly $1.2 billion dollars but has a farebox recovery of 58% and serve nearly 380,000 passengers a year, putting it in Amtrak’s top 5 best performing trains. The Amtrak Pioneer (Trains 25/26), which would has several different options. The first 2 options would serve Seattle to Denver or Salt Lake City via Portland, Oregon, Idaho, Utah, (Wyoming or Colorado, optional route) This however would be around $400-500 million dollar start up, 40% farebox recovery and serve between 107,000 to 111,000 passengers a year, putting it in tier with the lower performing trains. I will have more about this 2 trains in a 2 part series starting next week. Shared corridors will only allow trains a maximum speed of 79mph, even after the installation of Positive Train Control. This means trains that run together, freight, Sounder, etc, will be restricted to only 79mph. My opinion is passenger trains and freight trains should increase speeds accordingly, meaning, where applicable, 90mph passenger trains, 70mph intermodal/container trains, and 60mph non-tonnage restricted freight trains. I was pleased with the rest of the report as WSDOT is looking proactively at all manufactures for future tilting equipment. Requirements such as 8 inches of cant deficiency, 290 to 350 passengers a train, powered locomotives at both ends of the train and faster acceleration above 79mph. This still of course fits within the range of Talgo but it also allows bids from other manufactures, such as Alstom and Bombardier. Gobble Gobble: Amtrak will be running the special “Turkey Trains” for the Thanksgiving week, November 25-29. These trains will use conventional Horizon or Amfleet (or a mix) with a journey time of 4 hours and 15 minutes. The extra trains will only run between Seattle and Portland. There will not be any extra Seattle – Vancouver BC service. Trains are now available for reservation but as I scanned through already, several trains are sold out or near sold out! Continuing yesterday’s article with projects South of Downtown. Seattle: I may have been seeing things this morning but it appears the the King Street Station clock has stopped working. I’ll e-mail the City of Seattle on Monday if it appears that way. Construction bids for the new Seattle Amtrak Maintenance Facility seem to be slow. So far, only McGraw-Hill Construction appears to be the only bidder Construction is estimated to take 36 to 40 months. This would provide about 382 jobs according to Recovery.org. More below the jump.